The diversity of cheeses available at the High Weald Dairy and beyond show how complex flavours can be developed from the same base ingredient, milk. Starting with a sheep, goat or cow milk gives a different flavour to begin with but the process of making and maturing also brings out different flavours. 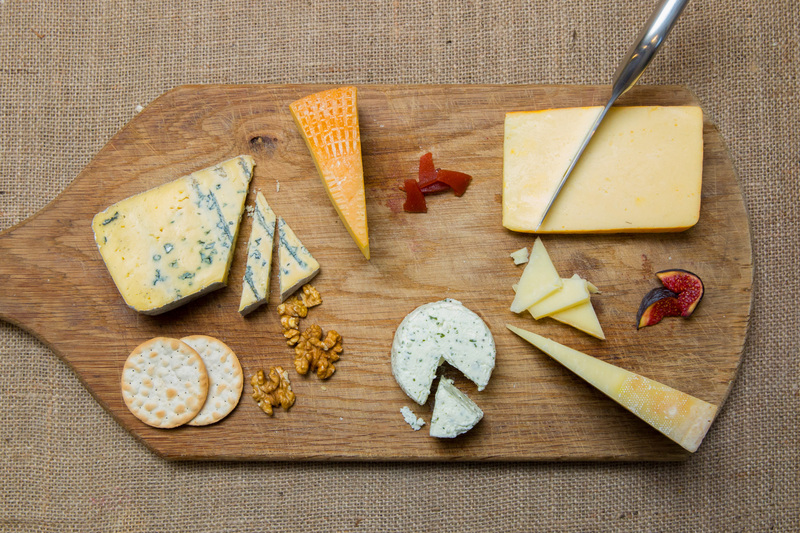 Taking a little time to taste cheese can help you appreciate it even more. Here’s our guide to how to taste cheese! As with tasting wine, you can use (almost) all the senses to help you appreciate the flavour of cheese. Most cheeses are best tasted when they have come to room temperature so it is a good idea to take your cheese out of the fridge about an hour-and-a-half before you intend to eat it. Fresh cheeses, like our Sussex Slipcote, are the exception to this rule and we would recommend leaving them out of the fridge for a maximum of half an hour before eating, any longer and the cheese continues to mature. If tasting a selection of cheeses, it is also a good idea to have some slices of apple and a glass of water to cleanse the palate between cheeses. Look at your cheese to begin your tasting experiment. What colour is the rind? Is it moist, dry or cracked? Smooth or ridged? This should give you an idea of the age of the cheese. The colour of the cheese will give you an idea of which milk it has been made with. Goat milk is whiter than any other, cow milk is more yellow. Feel the cheese to test the texture – is it soft, crumbly, hard? Smell the cheese! The flavour of the food we eat is sensed through a combination of smell and taste. Most people will have experienced being unable to taste food when you have a blocked nose or heavy cold. Break a piece of cheese to release the aroma. Smelling the cheese before you put it in your mouth will give you an idea of the taste and may reveal some of the subtle flavours. Put the cheese in your mouth. Roll it around your tongue and push it against the roof of your mouth. This is where taste receptors are located and the basic flavour is detected through these – is it sweet, salty, acidic or bitter? You can also note the texture of the cheese at this stage – is it smooth, creamy or crumbly? As you swallow the cheese take a breath in through your nose to detect further flavours – is it nutty, buttery, smokey, farmyardy – or something else? Take time to allow the flavours to come out from the initial taste to the finish. A cheese tasting is included as part of our one-day cheese making course at the High Weald Dairy and when we attend shows and farmers markets we’re always happy for people to try our cheese to help them decide which cheeses they like best. Why not host your own by buying a selection of cheeses to share and enjoy with friends? The tasting notes below could help form a starting point for conversation. These terms for describing the taste of different cheeses may help! Farm/barnyard – in cheese terms this is usually a positive trait! It smells like a barn or cows. Saint Giles – A continental style, semi soft creamy cheese similar to the Saint Paulin style of cheese. Named after our village church, it has a rich buttery texture, a creamy mild flavour and a bright orange rind. Sister Sarah – Made using fresh goat milk, Sister Sarah is an award winning semi soft cheese, matured for 8 to 12 weeks, and named after Marks wife. It is a mild cheese, with a delicious “caramel like” flavour, and without any of the “goatiness” often associated with goat cheese. The cheese is often coated in annatto (a south American berry) to create the orange colour of the rind. Little Sussex – Based on the fresh 100g Plain Sussex Slipcote soft sheep milk cheese, the white mould penicillium candidium is sprayed on the cheese surface soon after making. The little cheeses are allowed to mature in the cheese store for 8 days, turning daily, by which time the cheese is covered in its fluffy white coat, lost some 15% of it weight and gained flavour. Little Sussex will continue to mature in the fridge and become stronger and more punget by the end of its best before date. Brighton Blue – This cheese has a slightly open, semi-soft texture, a mellow blue flavour and a slightly salty finish. The distinctive blue green veins in the cheese (created by penicillium roqueforti) deepen as the cheese matures, and the taste of the blue becomes stronger. During maturation, the wheels develop their own attractive natural edible rind. Sussex Marble – A semi soft creamy cheese and is based on Saint Giles. Once matured, the whole cheeses are gently broken up and then infused with fresh natural garlic and herbs, before being re-pressed. This creates a very creamy, buttery texture and a medium strength garlic flavour. Ashdown Forester – an attractive cheese with its basket weave pattern on its surface. Made from organic cow milk and matured for 8 – 10 weeks, the cheese is mild in strength, but has a delicious flavour. Also available in a smoked variety which has been naturally smoked over oak shavings. Sussex Slipcote – A fresh soft organic sheep milk cheese, with a light creamy fluffy texture and a slightly sharp refreshing flavour, without a strong taste. Slipcote is a traditional word meaning “little (slip) and cottage (cote) cheese. Halloumi – A salty brined cheese, originally from the Mediterranean. Traditionally made from sheep milk (but now most imported cheese is made from cow milk) it is great dry fried or grilled to a golden brown and served with salads or in a stir fry.